Here's an interesting article. Apparently Bill Maher - whom I've never heard on TV because we don't get television reception - went on a "disgustingly filthy diatribe against “white men” and the type of women they like." Gee, um, what kind of women can that be? "He pompously posited," notes writer Patrick Dorinson, "that white men like these women saying, 'my theory is that these women represent something those men miss dearly: the traditional idiot housewife.'" Oh, got it. White men like traditional idiot housewives. 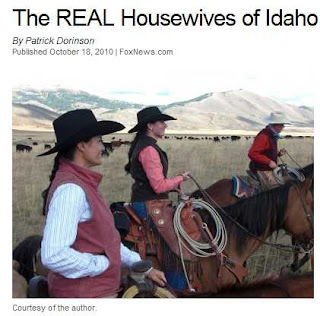 Apparently never at a loss for words, Mr. Dorinson came to the defense of us "idiot" housewives by visiting some hardworking women here in Idaho. I thought this was a spiffy testimony to ALL the "idiot" housewives out there, the ones working their fannies off with their husbands to raise their kids, run a household, and make ends meet. Let's hear it for Mr. Dorinson. We must be on the same wavelength, I was just reading this piece before I popped over here. There was an interesting show on Animal Planet called The Last American Cowboy, that followed three different rural families in Montana raising cattle. What a difference watching hard-working-salt-of-the-earth people as opposed to half-naked-drunken-promiscuous-thugs and thuggets. bill maher is the scum of the earth...as a comedian he is not funny. he is a hater. he hates god, he hates marriage, he hates anything that is not politically correct...he is awful. what gets my goat is the channel that he is on keeps him. usually he does not use curse words- but it does not matter. what generally comes out of his mouth is so hateful and disrespectful to the common man that it makes me sick. Unfortunately, Bill Maher has been around a long time. Too long. He's just another foul-mouthed, hateful liberal progressive with too much time on his hands and too much exposure given to him by the liberal media. The man is obviously miserable and wants to make everyone who doesn't agree with him just as miserable. We avoid ever watching, hearing or reading anything he has to say. The same goes for the "ladies" on the View and the entire far-left bunch of liberal loons. Liberals like Mr. Maher are spoiled, self-centered, hateful, overgrown children. Best to just ignore them! When Maher speaks, nobody should listen. Bill Maher is a pompous, hateful, angry loudmouth whose vitriol got him into some trouble immediately after 9/11. Like all snakes, however, we was able to crawl out of the mess and resume his hate-speech on another network. Maher has never married, has a history of dating black women, and is on the board of PETA. Perhaps he's still "finding himself." I'm surprised Maher didn't end up on MSNBC. That's a network where he would fit in quite well. Instead, he's currently on HBO. Oh, and he claims to be a Libertarian. Yeah, right. Without having television, it seems that I've missed the privilege of hearing the wise words of Mr. Maher. I guess he'd be appalled to know that I'm a happy wife typing this at home, while I'm barefoot AND pregnant! Maybe it's just me, but in my own personal circle of close friends that are SAHMs...we all have a college education and chose to stay home for the benefit of our families. It's a huge disservice for Mr. Maher to refer to my very intelligent, critical thinking, hard-working SAHM friends as idiots! I haven't been able to track down this "disgustingly filthy diatribe" yet so can't comment on it, but generally I like Bill Maher. I think he is brilliant and has a big following over here. Watch his film "Religulous"
I don't ride horses and I don't herd cows, but I raised my own children instead of pawning them off on someone else while I chased the obscene dollar and someone else's vision of "fashion and wealth". My family knows emotional warmth, decent social politeness, familial cooperativeness and LOVE. We never diatribe in ugly language, in public or in private, even when we disagree with someone. Not every woman is of the mental nature to be a caretaker and homemaker, and that's perfect, for her. Society most certainly should allow her to be all that she can be in the field of her choice. Every human, male or female, should be encouraged to reach for high goals. But why has it become so incorrect to be one of the few, in this modern world, to have and teach Mother Skills that it's a subject of foulness and verbal spew? What kind of bad potty training taught that man that any woman who wants to train and care for her own children, and the men who want to let her do that, is deserving of vulgarity and public ridicule just for the fact? Personally, I'm glad I never knew his mother, or who ever his childhood caretaker was, that he hates such people so much. So many people like to demean housewives, but I bet everyone of them liked, or would have liked to have grown up with one. P.S. I have a college degree and still happily chose to raise my own children. Funny too how everyone loves a home-cooked meal, but make fun of any woman dumb enough to stay home to make one. There are many women who work full time outside the home and also prepare a healthy home cooked meal every night. --L.S. I am NOT a feminist. I respect someone's choice to be a housewife or whatever else they want to be. That being said, let's be honest here: anyone who is female, married, and fertile can be a housewife and a stay-home mom. Becoming a professional takes years upon years of demanding tests, degrees, licenses, and performance evaluations. If I wanted to be a stay home mom, all I would have to do is get pregnant and then wait nine months and...voila! I now have the official title of Stay At Home Mom. If I wanted to be, say, a medical doctor I would have to...take the SATs and write essays to get into college, take demanding science courses with grueling labs and stressful tests, graduate, take the MCAT, write more essays, go to four demanding years of medical school and an even more grueling residency, take the boards (an 8 hour exam) etc. Statistically, 88% of women will become mothers, but less than 3% of people (women AND men) obtain professional degrees, making the latter more of an accomplishment. As a proud Republican, I respect peoples' rights to live as they see fit, but let's not pretend that the title of housewife requires as much professional training and rigor as high level degrees. Parenthetically, I would also like to point out that MANY women who devote their lives to being devoted homemakers are left in financial shambles after their breadwinner husband dies; life insurance lasts 10 years at most, and a woman who has been out of the work force for 10+ years will have a hard time finding gainful employment to support her children if G-D forbid her husband dies. Also, I know of several very religious families who have divorced or had tragedies such as unemployment or the husband getting cancer happening to them. I know of one family where the woman's career as a lawyer literally saved her husband's life as the man had cancer and was unable to work because the chemo made him too weak; it was thanks to her salary that they were able to pay for his medical treatments and still keep a roof over their heads and food on the table. At the end of the day, there are pros and cons to every situation. With a 50% divorce rate, an unstable economy under President Obummer, and the possibility of illness or disability, I would rather be employed (even if only part-time) to keep my foot in the door to protect myself and my family.